still expect you to dish out dessert at every meal. Foods can be broken down in three major categories. I don’t think I need to expand on Categories #1 (whole foods) or #3 (sweets). Foods that fall under Category #2 are burgers, hot dogs, pizza, chips, crackers, bagels, muffins, flavored yogurt, and anything else you can think of that is sold at events, or comes in a package, or is heavily processed. 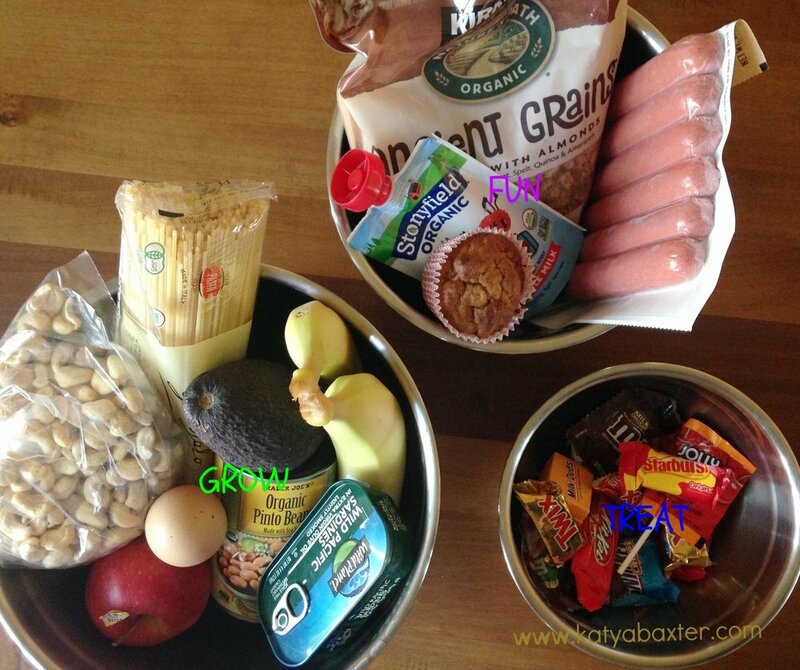 First, you ask your child which category she thinks the food falls under. Then, you ask her how much of this or that food you agreed to eat in your family. ‘some’, and the ‘most’. You can use quantities or frequencies. a small treat every once in a while and enjoy it”. Introduce the game and the rules sometime between meals when your child is not hungry. Show her some examples of different foods and explain the categories. To explain different size or frequencies, use objects or draw big, medium and small circles to give her a point of reference. Make a VERY clear explanation of how often and how much you, as a family, eat foods from different categories. Demonstrate by example by eating those proportions yourself. part of responsibility, which is to provide the meal and the timing of the meal. you can be at peace in the evening when you serve chicken soup with some bread and fruit. by reminding her of the family rule: eat fun foods and treat foods a little and eat growing foods the most. and drawing that boundary, the faster your kiddo will come around and learn that rule. something because it makes their bones stronger but simply because it tastes good to them. have fun with it. It’s your kiddo’s journey as much as it is yours.